107 Beacon is located on the south side of Beacon, between Arlington and Berkeley, with 105 Beacon to the east and 109 Beacon to the west. 107 Beacon was built ca. 1862, one of six contiguous houses (101-103-105-107-109-111 Beacon) built at about the same time and in the same style. Click here for an index to the deeds for 107 Beacon. On December 29, 1862, 107 Beacon was purchased from George Upham by merchant Frederick Hall Bradlee. He and his wife, Lucretia (Wainwright) Bradlee, lived at 147 Tremont and later at 13 Commonwealth. 107 Beacon became the home of Frederick and Lucretia Bradlee’s son and daughter-in-law, Frederick Wainwright Bradlee and Mary (Horton) Bradlee. They previously had lived with his parents at 147 Tremont. Frederick W. Bradlee was a commission merchant in the East India trade. Mary Bradlee died in December of 1880. Frederick W. Bradlee continued to live at 107 Beacon and also maintained a home in Nahant. Their surviving sons, Thomas Stevenson Bradlee and Roger Wainwright Bradlee, lived with him. On November 23, 1887, Frederick W. Bradlee acquired 107 Beacon from his father. In June of 1892, Thomas S. Bradlee married to Maria Godey Segar. After their marriage, they lived at 107 Beacon with Frederick Bradlee. Thomas Bradlee was an ornithologist and owner of Pine Wood farm in South Sudbury. By 1900, Roger Bradlee had moved to New Zealand, where he raised sheep. He died in November of 1907. During the 1897-1898 winter season, the Bradlees were living elsewhere and 107 Beacon was the home of Mary Morse (Barker) Taylor, the widow of dry goods merchant William Oliver Taylor, and their children, Frederick Spaulding Taylor and Ellen Richardson Taylor. They previously had lived at the Hotel Vendôme. By the 1898-1899 winter season, Frederick W. Bradlee and Thomas and Maria Bradlee had resumed living at 107 Beacon. 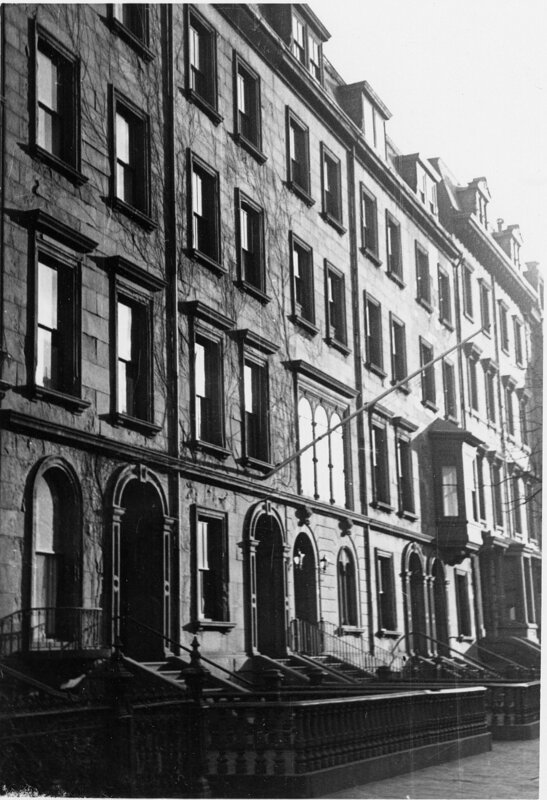 During the 1905-1906 winter season, the Bradlees were living elsewhere and 107 Beacon was the home of Herbert Dumaresq and his wife, Friederika (Slade) Dumaresq. They had married in January of 1905. Herbert Dumaresq was a partner in Jordan, Marsh & Company, retail dry goods merchants and department store operators (his first wife, from whom he was divorced, had been Julia Maria Jordan, daughter of Eben Dyer Jordan). The Dumaresqs traveled abroad in 1907 and by the 1907-1908 winter season, were living at 327 Commonwealth. During the 1906-1907 winter season, the Bradlees were in Bermuda and 107 Beacon was the home of John Lawrence and his wife, Martha Endicott (Peabody) Lawrence. Their primary residence was in Groton, where he owned a farm; he also was a trustee with offices in Boston. By the next season, they had moved to the Lenox Hotel at 61 Exeter. By the next season, Frederick Bradlee was once again living at 107 Beacon. Thomas and Maria Bradlee continued to live with him during the 1916-1917 season, after which they made their winter home in Bermuda and their summer home in Sudbury. Frederick Bradlee continued to live at 107 Beacon during the 1918-1919 winter season, but was living elsewhere for at least part of the next two seasons. 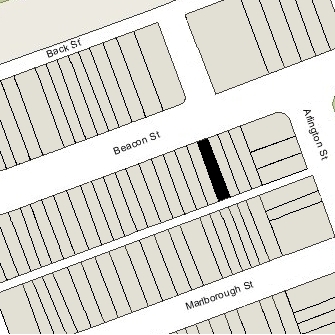 In January of 1920, at the time of the US Census, 107 Beacon was the home of Mrs. Rose A. (Post) Howard, the widow of Thomas Howard Howard. By 1921, it was the home of banker Robert Sturgis Potter and his wife, Dorothy (Tweedy) Potter. They had lived at 282 Marlborough in 1920. By 1923, they were living at 11 Gloucester. By the 1921-1922 winter season, Frederick Bradlee had resumed living at 107 Beacon. He continued to live there until his death in January of 1928. 107 Beacon was inherited by Thomas S. Bradlee, and in March of 1928 he applied for (and subsequently received) permission to significantly remodel the house, including adding new bay windows on the second story in the front and on the first story in the rear. The remodeling was designed by architect Richard Arnold Fisher. 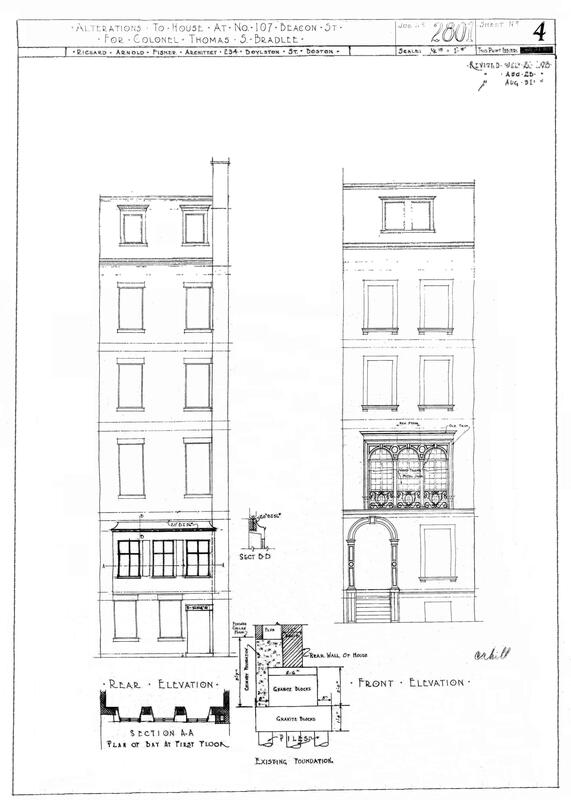 Plans for the remodeling are included in the City of Boston Blueprints Collection in the Boston Public Library’s Arts Department (reference BIN B-1). 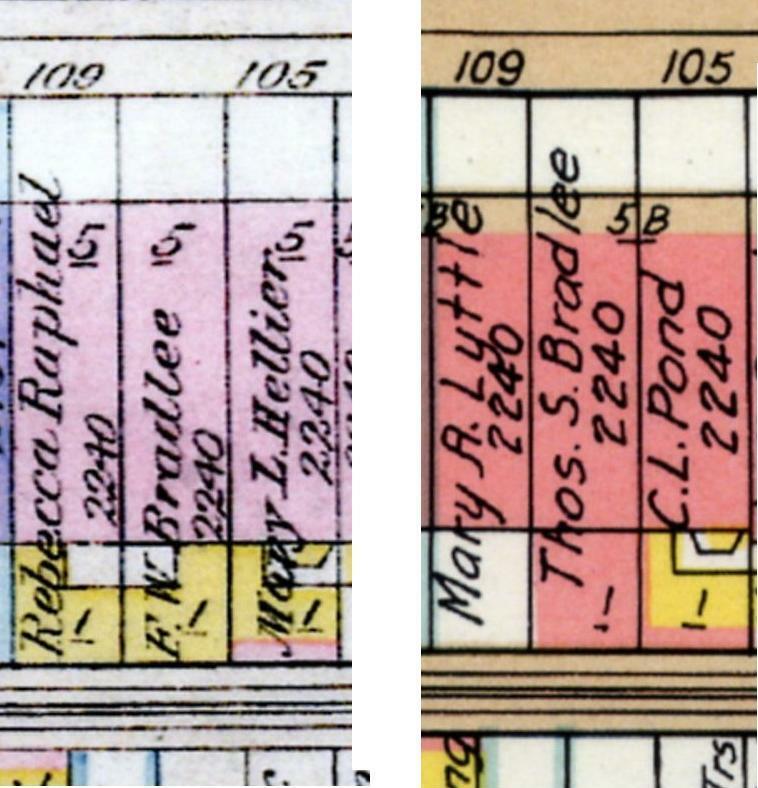 1928 (left) and 1938 (right) Bromley maps showing 107 Beacon with wooden ell in 1928 and brick rear addition in 1938. In October of 1928, Thomas Bradlee amended the plans to include a new one story brick addition in the rear, below the new bay window, the width of the house and extending twenty feet to the alley. It replaced a previous wooden ell. The addition, also designed by Richard Arnold Fisher, was built (it appears on the 1938 Bromley map) but subsequently was removed. 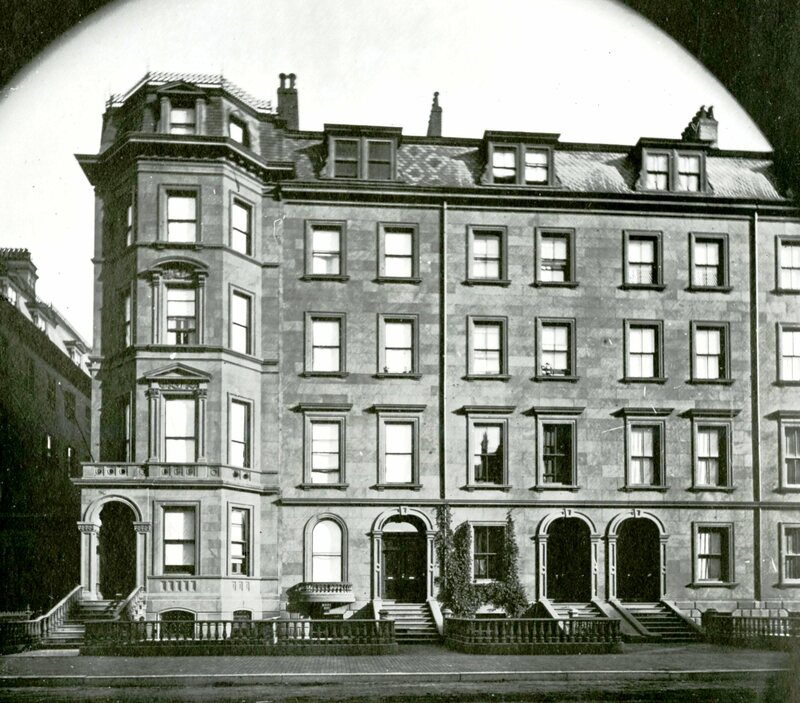 After the remodeling was completed, Thomas and Maria Bradley made 107 Beacon their Boston home. Thomas Bradlee died in January of 1937, and on January 3, 1938, his estate transferred 107 Beacon to Maria Bradlee. She continued to live there until her death in March of 1953. In December of 1953, the estate of Maria G. Bradlee received permission to allow the house to be used as the Italian Consulate. It is unclear whether it was, in fact, used for this purpose. On June 25. 1954, 107 Beacon was purchased from the estate of Maria Bradlee by the John A. Volpe Construction Company, and on December 17, 1954, it sold the property to Shirley Clifford Speed. 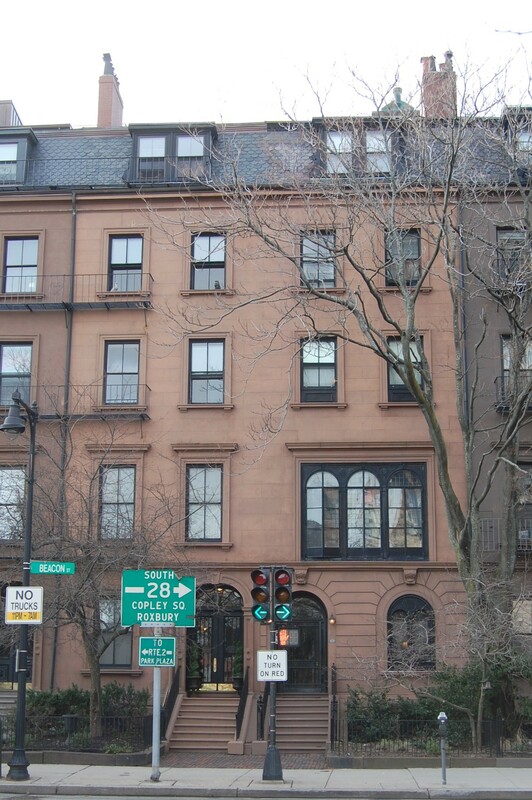 S. Clifford Speed was a real estate dealer who converted many Back Bay houses into lodging houses and apartments. In March of 1955, he applied for (and subsequently received) permission to remodel the house into five apartments. In April of 1955, he amended his plans to increase the number of units to six. After they were remodeled, he lived in one of the apartments. He previously had lived at 94 Beacon, and before that at 33 Commonwealth. In March of 1958, S. Clifford Speed acquired 105 Beacon. On July 19/20. 1961, 105 and 107 Beacon were acquired from S. Clifford Speed by Thomas Francis Keating, Jr., trustee of the Pond Realty Trust. On July 31, 1970, Thomas Keating transferred 105 and 107 Beacon to himself as trustee of a reorganized Pond Realty Trust. His wife, Doris J. (Bordasch) Keating subsequently was named as co-trustee. On September 29, 1995, Thomas and Doris Keating transferred both properties to Doris J. Keating and Peter M. Keating (their son), trustees of the Green Nominee Trust. Thomas and Doris Keating subsequently divorced and she married again, to Victor Pena-Cruz. 107 Beacon remained an apartment house in 2015.